Let me kick of this Mother’s day post by giving a big salute to my Mom. I am sure we all agree that mom has played a key role in transforming us into what we are today… even if we are like two peas in a pod or totally chalk and cheese. 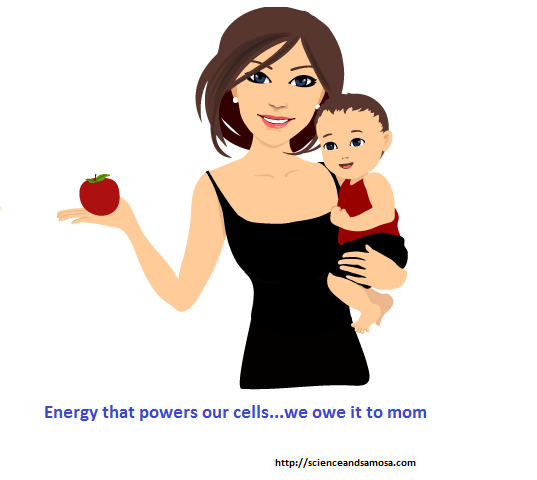 You would be surprised to know that it’s just not at behavior level moms influence us, but she influences our genetic makeup too ! How intelligent a child is depends on mom, and not on Dad….science says so. Genes for intelligence is present on X chromosome and women have two of these. But then things are not just that simple. Mothers do have two X chromosomes, but they aren’t identical chromosomes, and of course, they get one of them from their fathers. Mitochondria are structures present inside cells that helps in converting the energy from food into a form that cells can use. Though most of the DNA is packed in cell nucleus, mitochondria also have a small amount of their own DNA and this is essential for powering the cells. This mitochondrial DNA comes only from the mother and nobody fully understands why or how fathers’ mitochondrial DNA gets wiped from cells. If you are a women, you will experience similar milestones as that of your mother. Study carried out by Institute of Cancer Research at the University of London, says that there’s a 57 percent chance that a girl will start menstruating within three months of when her mother started her period. If your mother suffered from migraines, breast cancer, rheumatoid arthritis, Alzheimer’s and other health concerns, then you may also be at risk. Don’t fret. Ask your mom about her health problems and bring in lifestyle changes to keep those diseases away. Do you know that disease like hemophilia and Duchenne muscular dystrophy is most commonly seen in boy child. Carrier is someone who has one abnormal gene, but does not show any disease symptoms. This happens with respect to X-linked recessive disease. Since women have 2 X chromosomes, a recessive abnormality will not turn into a disease or will stay as mild one. But in men since they only have one copy of X, if this X carries the problematic gene, then disease will get expressed. So it’s always advisable for women to perform a genetic testing to check for carrier state, in case in their family there are cases of X-linked diseases. My mom, my Shero! Checking these facts made me go ga-ga over my Mom! Female of the species are always powerful, I suppose. I didn’t know we inherit so many traits from our mother. I didn’t know much of these facts Hena, you left me a little more enriched, thanks. I got what you intend, thank you for posting. Woh I am happy to find this website through google.